It’s farm dinner season. Every summer I try to attend at least a two farm dinners. They’re one of my favorite summer outings, and I love supporting these wonderful farms that provide us with our local bounty. I write about them a lot here, too. 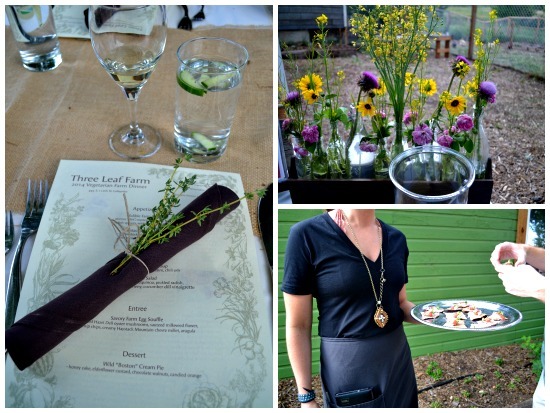 My first farm dinner of this 2014 season was at Three Leaf Farm, in Lafayette on the Summer Solstice. 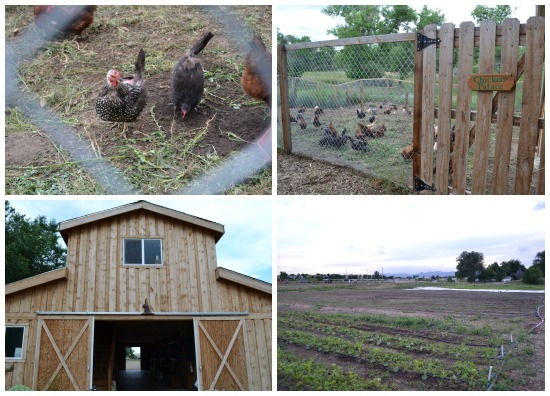 Owned by Lenny and Sara Martinelli, who also oversee and run Dushanbe Tea House, The Huckleberry, Zucca Italian, Chautauqua Dining Hall, Leaf, Naropa Cafe, and Aji – have their hands full as the farm has also become their home. Albeit 100% organic, they haven’t certified just due to the expensive nature of certification. They grow organic vegetables, fruits, herbs and flowers and beyond providing produce for their seven restaurants, they also have a full farm dinner schedule and offer workshops, cooking classes and private events. 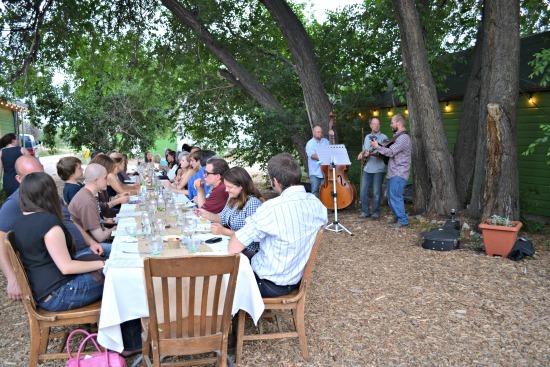 Alongside the banks of Coal Creek and overlooking the Continental Divide, this farm dinner was influenced by foraging (mostly right from their farm) and a vegetarian menu, which was run by Rachel Best the Executive Chef at Leaf in Boulder. 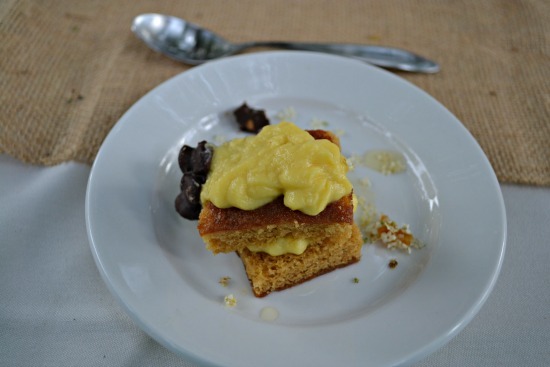 We started with “Edible Farm Field” appetizers as we roamed the farm and listened to the live music of a string band, took a look at the little goats, their beautiful stable/barn, and their horses. 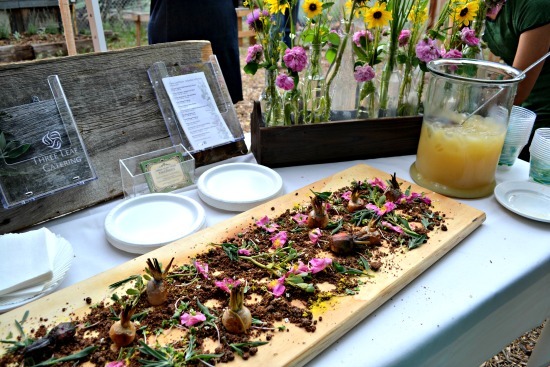 People mingled over a beautiful display of porcini “dirt” (edible) with roasted beets and turnips with wild roses and cattail pollen. They also passed flax crackers topped with Haystack goat cheese, yellow dock root strawberry jam with pennycress seeds. 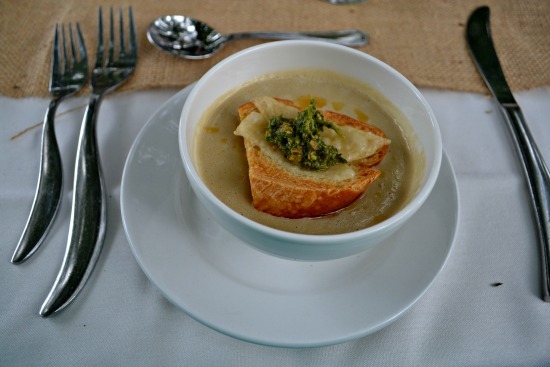 Next we had a thistle and artichoke soup, with orache pesto, parmesan crostini topped with chili oil. 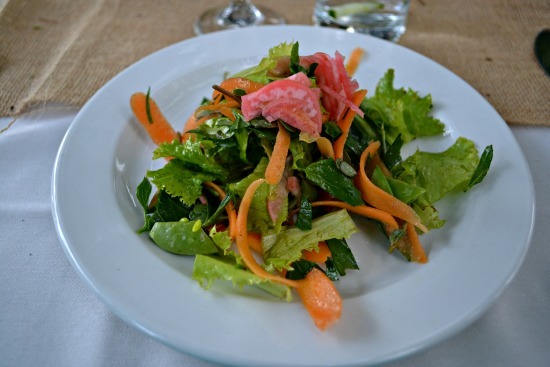 For our salad, it was a wild farm salad with kochia, mixed greens, quinoa, pickled radish, carrot ribbons, crispy homeny and a cucumber dill vinaigrette. Our entree was the most fluffy and light savory farm egg souffle I’ve had in a long time. It was with roasted hazel dell oyster mushrooms, sauteed milkweed flower, turnip chips, creamy haystack mountain chevre, millet, and arugula. 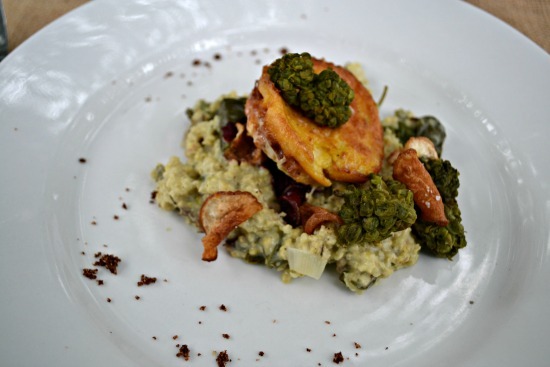 I could have had multiple of this flavorful, interesting dish. For dessert, we had a wild “Boston” Cream Pie of honey cake, elderflower custard, chocolate walnuts and candied orange. The wine was provided by Colorado-local, Talon Winery and was $15 for a wine pairing, for every dish of the evening. It was a lovely evening, that was very relaxed and enjoyable. I highly recommend you sign up for a farm dinner somewhere in Colorado to support your local farmers and purveyors, it’s a great way to enjoy our amazing summer. 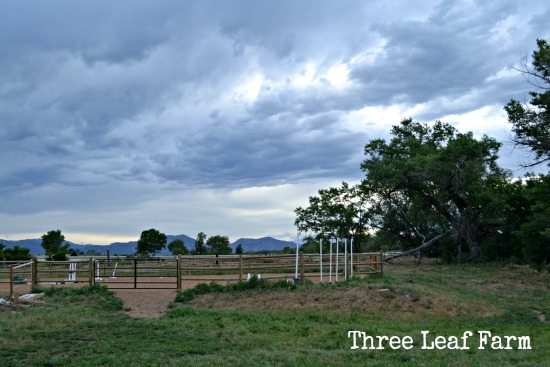 You can learn more about Three Leaf Farm here: http://threeleaffarm.com. Looks delicious! Someday I’ll join you on one of the dinners.